ReportGorilla is delighted to offer Typeform users effortless and powerful reporting. ReportGorilla creates beautiful reports from your typeforms in an instant. It uses built-in expert knowledge and automation to create professional reports and presentations in a variety of styles and outputs from Typeform data. Save time and get access to powerful reporting for your typeforms at the press of a button. Create your reports as web pages, as Word, PowerPoint or Excel documents you can edit, or as collections of charts/table images you can use anywhere. You don't need any technical or analytical know-how to use ReportGorilla. It's report creation by pictures. Just point to what you want and let ReportGorilla do the heavy lifting. ReportGorilla examines your typeform and shows the reporting options that work well with it. Then you can discover the possibilities with just a few taps. Browse report options, view thumbnails, read about any report and create realistic previews. How will my Typeform report look? ReportGorilla Previews show you exactly how your report will look, using realistic test data. This is a powerful learning tool that removes uncertainty. Previews are free, so you can try before you buy. Every time. Previews also makes it easy to discover different useful ways to look at your typeform data that you may not have thought of. Find the stories you didn't know you had. There is no subscription. You pay only for the reports you create with real data. Just add reports to your basket and they will be instantly created when you check out. That's it! Conveniently find all your completed reports on the My Reports page. 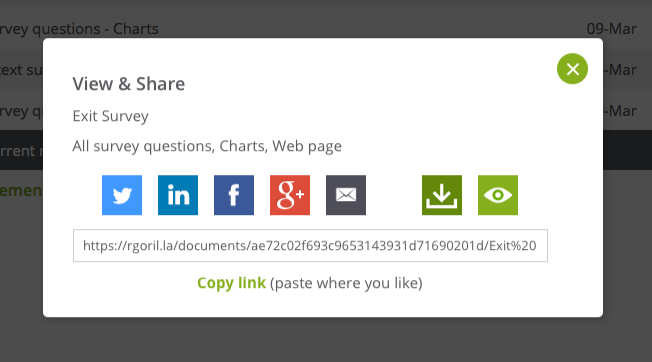 From there, you can easily view, share, bulk download or delete your survey reports, so you are confidently in control. In My Reports, click any View button to open the View & Share panel. With a click or two, you'll be done. If you're already a Typeform user, you can immediately discover what ReportGorilla can do with your surveys by trying it now, FREE. See it in action in this short intro video, so you can see how easily ReportGorilla can help you get more value from your survey data.